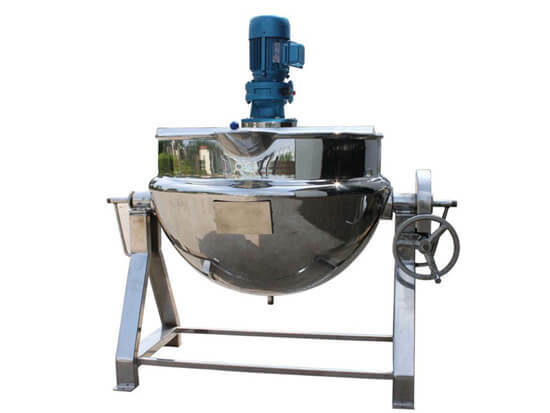 Amisy jacketed kettle is designed to cook and boil various foods which enjoy great popularity in many industries such as restaurants and industrial kitchens. It has 2 kinds of the heating means: by steam or electrical, we can add the agitator and cover according to your needs. Our jacketed kettle is the ideal equipment for food processing to improve the quality, shorten the time and improve the working condition. 1. All the materials in contact with food are made of stainless steel, has the feature of resistant to corrosion which is in accordance with GMP Standard. Generally, the jacketed kettle consists of pot body and support legs, the pot body is a double-layer structure composed of inner and outer spherical body, the interlayer is heating by steam or thermal oil. The detailed constituent part of Amisy jacketed kettle is boiler body, stir device, tilting system, worm wheel, worm rod and the boiler body can be rotated within 90degree. 2. It is also used in large restaurants or dining room to cook soup, stew, boil congee, etc. 1. The use of vapor pressure, not a long time exceeds the rated working pressure. 3. For tilting type and mixing type jacketed kettle, before each time to use, you'd better add the oil to all the rotating parts. We suggest you use cooked vegetable oil for the surface component of mixing type jacketed kettle; other places are used 30#--40# machine oil. How to Maintain the Jacketed Kettle? 2. Check the pressure gauge and safety valve regularly, if there is a fault, please replace and repair timely. 4. When the outer pot after years of corrosion thinning to below 2mm, please stop using.